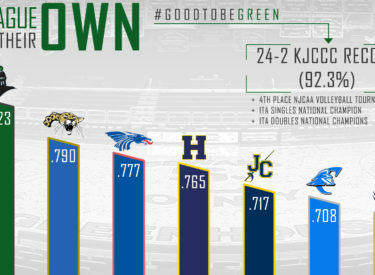 LIBERAL, Kan. – Seward County athletics is off to another highly successful year, going into the winter break with the best combined Jayhawk Conference record. When compared against the other 20 members of the Kansas Jayhawk Community College Conference (KJCCC), the Saints and Lady Saints are proving once again that the conference runs through them. Sitting with a combined 24-2 record in conference play this season, the 92.3 percent winning percent by Seward County is nearly 14 percent better than the next team, Barton, who has won 79 percent of their league games. Additionally, Seward County has been as dominate as ever playing in front of their fans, holding a perfect 15-0 record in conference and region games played in the Greenhouse this year. Overall this season, Seward County has a 51-11 record (.823). The Lady Saints had yet another historic season in 2018, finishing 32-7 overall and completing their second straight 16-0 Jayhawk Conference season. The Lady Saints enacted revenge on the Hutchinson in the Region VI Championship, sweeping the Blue Dragons 3-0 to earn an automatic bid to the NJCAA National Tournament. Seward won their first two matches on the Tournament, sweeping Snow in the opening round and winning in five sets over Polk State in the Quarterfinals to advance to the Final Four. The Lady Saints fell to College of Southern Idaho in the Final Four, but their fourth-place finish is the best in program history. The impressive play by sophomore Luz Sierra earned her 1st Team NJCAA All-American honors. The Fall of 2018 was perhaps the most successful in program history for Seward County tennis, coming away with two ITA National Championships including the first ever ITA Singles National Championship. Sophomore Nicholas Rousset cruised past the defending National Champion from Tyler Junior College, 6-4, 6-1 to win the singles bracket. In doubles play, Sander Jans and Gabriel Nery claimed the programs third ITA Doubles National Championship, defeating the team from ASA Miami 6-3, 6-4. New Lady Saints coach Austin Mefford has his team off to an impressive start in 2018, with a 10-2 record overall, while being ranked No. 14 in the NJCAA Polls. Seward scheduled tough opponents to open the season, already with three ranked wins under their belt with more surely to come. The Lady Saints currently sit one game back from Hutchinson in the Jayhawk Conference with a 4-1 record in KJCCC play. Seward will travel to Pensacola, Florida for the Pensacola Classic where they will play Indian River and North Arkansas on December 28 and 29. Heading into break, Jason Sautter has his squad sitting atop the Jayhawk Conference with a 4-1 record in KJCCC play. The Saints ended the fall semester with a thrilling upset over the third-ranked Coffeyville Red Ravens to put them in first place in the conference. The Saints currently have one of the top defenses in the nation, allowing just 61.2 points per game. Holding a 9-2 overall record, the Saints will travel to Mesa, Arizona for the Fiesta Bowl Classic on December 27 where they will face Snow. The Saints have a chance for a rematch against No. 1 South Plains, a game that they lost by just three points earlier this season.